Everybody knows that learning to read is a fundamental skill for life. Throughout the Early Years and Key Stage One children are immersed in an environment rich in print. To enable children to become confident readers, synthetic phonics are taught throughout the school. The Jolly Phonics Scheme (Reception) and Read Write Inc are used to support the teaching of this. A parent meeting takes place in the Autumn Term to give you more information on how to help your child with reading in Key stage One. A leaflet is also available. What are the ‘big messages about life’ here? What are the writer’s attitudes, values and view on the world? What is the writer’s purpose? What style of writing is this? Which literary genre does it sit in? How does this text relate to the world of literature? Can you put the text in context: socially/historically/culturally? The Junior Library holds a plethora of books, which are colour coded by ability. Each child in the juniors has a library card and is given opportunities each day to visit the Library and take books out. Children in the infants also have the opportunity each week to visit the Infant Library. To help your child develop the above skills it is essential that you continue to hear your child read out loud each week. You should pose questions for them when they are reading. The links below are to a range of generic question prompts that you can use to formulate questions to pose when your child is reading. In the juniors, and as the children become more fluent readers, the reading diary becomes something else: a record of a child’s personal response, in writing, to the books they are reading. 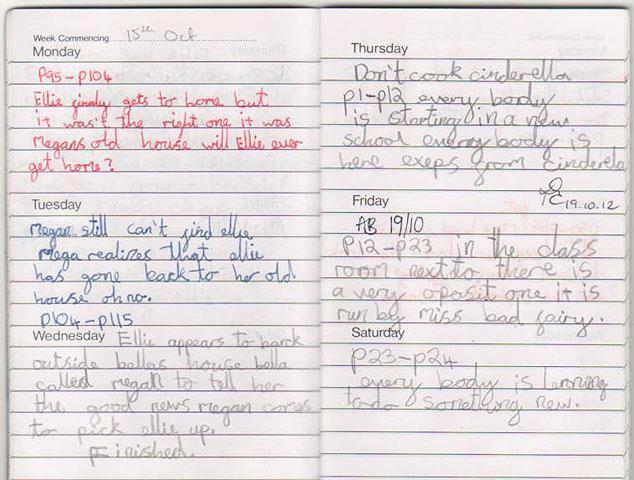 Here is an example of an outstanding reading diary in Key Stage 2.